Onyx is an engraved stone of unique beauty, popularly used for decorating interiors of residential and commercial spaces.It comes in a variety of colours, including black, yellow, green andwhite. Small pieces of Onyx are commonly used in making jewellery and statues, while slabs of backlit onyx decorate entire walls, counters, countertops and tabletops. AARNE transforms your interiors by highlighting the beauty of onyx panels with suave lighting. The natural beauty of these stones gives a stunning look to your interiors without the need for extensive decoration. Onyx comes in a wide variety of colours and patterns. A white onyx can be solid white or have gray or orange veins and patterns on it. The patterns vary with each stone and are unique for that piece. Whichever onyx you choose, you can trust that its quality and polish will create a rich, splendidambiance. According to your need, you may choose the specific colour and pattern in onyx that supports the atmosphere you want to create. 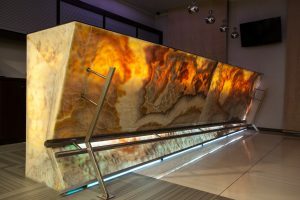 Backlit honey coloured onyx and yellow onyx are often used in counters and walls to create a sophisticated yet relaxed environment.The great variety you get in onyx provides innumerable choices in how you want your interiors to look. Most kind of onyx has designs and intricacies that are highlighted when illuminated.The fine veins and the collage of colours is clearly seen in an onyx slab when backlit, making it a marvelous piece of natural beauty.Usually, an onyx is given a sober uniform backlightthat illuminates the stone just enough to make its patterns visible. That creates a suave highlight that adds to the ambiance without attracting too much attention to it. Onyx can be cut into different shapes, including rectangular, circular and square. However, it must be cut perfectly and have a fine polish to it to look remarkable. Along with the quality of onyx, its flawlessmakehelps to create a premium, high-end piece of stunning décor, perfect in its beauty and design. Our process of cutting onyx slabs involves the use of a 5-axis CNC machine, which cuts the hardest of materials into complexcustomised shapes.It also gives the surface of the stone a fine polish that results inachieving an exquisite piece of onyx, luxurious in its look and feel. To make yourbeautiful piece of onyx look even better, AARNE illuminates it with gorgeous backlights to give it the ultimate look of a modern, classy piece of decoration. Having astunningbacklit onyx transforms the ambiance of a place with its minimalistic natural beauty. Whether it is onyx backsplash, onyx wall panels, countertops or showers, you can give astylish look to your interiors by getting a bespoke onyx.AARNE is a leading creator of bespoke sculptures, art & interiors made of marble, granite and metal.Our use of sophisticated technology and human talent helps us to create high-end bespoke onyx interiors, tailored to your needs. According to your specification, we design your piece and provide you with a premium backlit onyxwith the finesse of high quality and craftsmanship. Luxurious in its appearance, onyx is expensive, but spreads its stunning natural beauty to your environment for years. Give your interiors a makeover by getting a backlit onyx wall, backsplash or countertop. Your bespoke backlit onyx will give you the pleasure that only perfect beauty can provide, every day.